Have you ever had to teach a puppy to walk on a leash? Or maybe house train a kitten or a puppy? All of those things are quite challenging and take extreme patience and much time, but they can actually make you a better leader. Sometimes we learn from others just what kind of leaders we need to be. And when I say others, I don’t always mean other people. Many times, our furry friends teach us about leadership and motivation. I had a brown tabby cat named Bilbo that I adopted as a kitten. Shortly after Bilbo came to live with me I decided – only half-jokingly – that I would embark on a career as a cat behaviorist. This was before the days of the TV show, My Cat From Hell, and it was a pretty unique idea. The starting (and ending) point of my career as a cat behaviorist was to teach Bilbo to high-five for treats. I used a process called clicker training. After several weeks of multiple sessions a day using canned tuna as the reward, Bilbo learned to high-five on command. And for the last 17 years, once or twice a day, Bilbo would – with an air of disdain – give me a high-five in return for a treat. But only for a treat. If I had no treat in return for this behavior, you could just forget about it. Later on, I once saw a video of two cats who would ring a bell and then were given a treat. I have one of those bells that I use in a workshop I facilitate so I decided I was going to teach Bilbo to ring a bell for treats. Even after I got some negative feedback on Facebook for wanting to try this idea, I knew Bilbo could do it. In the end, Biblo had retaught me a number of valuable leadership lessons. I had no expectation that it would only take one time to show Bilbo how to ring the bell. It would be silly for any pet (or any person) to learn something so new without any additional training or reinforcement. And yet how often do we (myself included) delegate a new task to one of our employees or ask them to take on a role that requires new skills, and then expect them to know it? We expect them to be able to just do the new job without any training, coaching or development – perhaps learning by osmosis. Or we show them, or worse yet, simply tell them once what they need to do and expect them to be able to perform flawlessly. Here is my take away from our treat-bell sessions: Success is more about my motivation than it is about the motivation of those I am leading. It took Bilbo much longer to learn to ring the bell than it did to high-five, for many reasons. Some pertained to him and his motivation. Most importantly though, it had to do with me and my motivation. Seventeen years ago when I was teaching him to high-five, I was more motivated than I am now. I no longer have a dream of being the next cat whisperer, so the thought of tuna juice all over the kitchen floor is less appealing today. Plus I was not thrilled about being on the floor so much these days anyway. As leaders it is critical that before we start questioning our employees’ motivation we first look at our own. To successfully lead change, a leader must be totally motivated and committed to the outcome – otherwise those being led never will be. If you think about the great leaders of history, they had real motivation (both the good and bad ones). And to get that many people behind their cause (both good and bad), motivation was clearly beaming from them day in and out. Confusion is a natural outcome of change. We need to expect it and accept it. 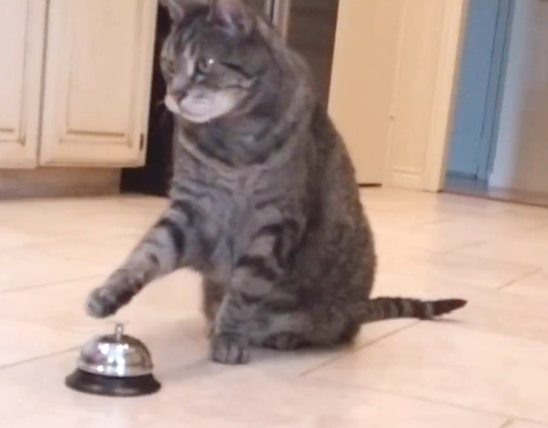 At the time, I was not even sure how to teach a cat to ring a bell. I did not have the skill, and it was challenging to teach him the skill, when I lacked the ability to teach it. And the same goes for teams and leaders. Leaders have the most credibility when they can show teams they have trained for the change and will go down into the trenches along with their teams. I can still see the confusion on Bilbo’s face when I would get the treats out and instead of putting up my hand for a high-five, I stuck a bell in his face. But it’s the leader’s patience through change, as well as their motivation get to the other side of change that make the leader successful. Well, after all the hard work and practice (and many extra treats), he did eventually learn the ring the bell for a treat. Here is the bottom-line leadership lesson. If we want our employees to successfully learn new skills, take on new tasks, and grow into new roles, we have to be motivated to help them do so. In addition, we must make sure we have the skills necessary to coach them, as well as the patience and commitment to see the process through to a successful outcome. Properly implementing change and achieving goals is about how good we are at leading – not about how good our team is at following. For more recent posts about effective leadership, check out the blog and sign up! Are you ready to start leading with motivation? Let’s talk about how to get started. To motivate our teams, inspiration must come from the top. See why teams will "follow the leader" when it comes to being motivated to succeed.